Swansea Trade Unionist and Socialist Coalition (TUSC): Finally an election broadcast worth watching! The Trades Unionist and Socialist Coalition (TUSC) is standing in 135 100% anti-austerity candidates in the General Election on May 7. In Wales we are contesting one third of seats. This means we qualify for fair coverage from the media, including an election broadcast. Mark's in Llanelli helping out fellow candidate Scott, who as a shop worker, has to work most Saturdays. 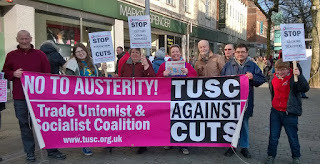 As well as 135 parliamentary candidates on May 7, TUSC is standing over 600 representatives committed to voting against all cuts in council elections in England and 2 council by-elections in Swansea. Dave Phillips (no connection to former Council Leader! ), TUSC candidate in Cockett will also be in Swansea town centre today.